How do I create an option pool? You want to click on CAP TABLE and then click on SUMMARY. This will bring you to the Summary page where you can see all of the different types of securities that you have for your company. (Commons Stock, Preferred Stock etc.) You then want to click on NEW SECURITY. This will bring up a menu of tiles on the screen where you can select what type of security you are wanting to add. You want to select Option Pool. 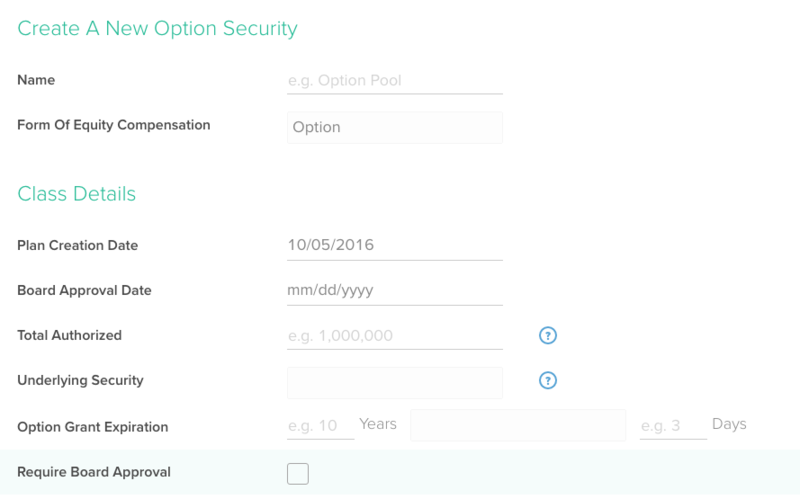 You will then see a form where you can put in all the details for the Option Pool that you are creating. This is where you can add your Board Approval Date, Number of Shares Authorized, Option Grant Expiration, and Exercise Periods for different scenarios. There is also the option to create a default vesting schedule if all of the option grants being issued have the same schedule. These schedules will be saved and can be used anytime you create and option pool or issue an option grant. If you scroll to the bottom of the form you will see a documents section. You can add any documents that you want to share with option holders when issuing your option grants. You can also add your Option Grant Agreement so that it can be shared with your option holders when the option grants are issued. When your option holders receive the Option Grant Agreement they can actually sign the document through our platform. For more information on this you can go to the Issuing Cap Table Paperwork article. Once you have entered in the necessary details for your option pool just click on create. You will then be prompted to add Option Holders. You can go ahead and add the Option Holders or you can always come back and add them to the option pool later.